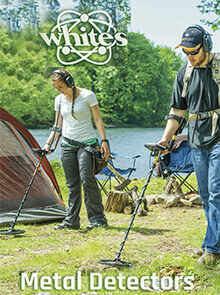 Each of Whites metal detectors is built to last, with quality materials, hardwired headphones, and durable electronics made to stand up to the elements. Their beach models are designed to be waterproof up to 25 feet, giving you more range even when the tide comes in, or even when your search takes you into the water. Of all the methods of treasure hunting, metal detecting is one of the most popular. The best metal detectors on the market will allow even first time hunters to come home with a few treasures. White metal detectors are easy enough for beginners to master quickly, and yet sophisticated enough for advanced searchers or commercial applications. Whether you're just out for an afternoon stroll and some casual coinshooting, or you're looking for advanced metal detecting tips, White's Electronics has it all in their catalog. Read the stories and treasure hunt ideas from their loyal customers and learn new ways to search and expose your next find. For beginners to pros, the detectors that go deeper to get the results you want are online at White's Electronics.